Don't Let A Lack of Skills Hold Down Your Career and Life. 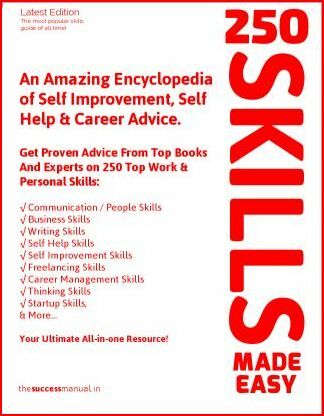 Get Proven Tips From 1000+ Top Books and Experts on 250+ Important Work And Personal Skills in The Best All-in-one Skills Book Ever. Since 2004, we have been refining and updating this 'encyclopedia of advice'. We have distilled the best advice from 1000+ best business, career, self help / self improvement books and experts in one place, saving you precious time and money. Use this powerful all-in-one resource to get instant help on almost any business, career or personal problem. Simply Browse The Bookmarks in File to go to Desired Chapter. An Amazing Encyclopeda of Self Help, Self Improveemnt and Career Advice. Don't Let A Lack of Skills Hold Down Your Career and Life. Get Proven Tips Distilled From 1000+ Top Books and Experts on 250+ Important Work And Personal Skills From One Book Right Now. Since 2004, we have been refining and updating this 'encyclopedia of advice'. So far, we have distilled the best advice from 1000+ best business, career, self help / self improvement books and experts in one place, saving you precious time and money. Spl. Offer: $19.95 $12 Only Save $7.95 PDF / EPub / Kindle Ready | 2 Free Guides Inside! See Full Table Of Contents: List Of All 290 Guides. A unique collection of 100+ useful self improvement tips, which are actually popular acronyms, arranged across 20 categories: Communication, negotiation, project management, career and jobs, time management, business management, among others. Simply browse the bookmarks in the PDF file to go to desired chapter. We all need skills. Most of us struggle at getting ahead in life despite having all the 'hard' skills. We need 'soft skills'. We need business skills. We need more & more skills. We need to know so much to succeed nowdays. The Success Manual is a must for everyone, from fresh college graduates and employees to freelancers and entrepreneurs. This popular all-in-one encyclopedia of advice is the only all-in-one skills encyclopedia you'll ever need to plug your 'skill gap'. Professionals' Guide To The Top Rung. Interested In A Successful Career? Presents All Self-Improvement Ideas In One Single Resource. Q: Where will I be buying The Success Manual? A: You can buy The Success Manual on Gumroad.com. You will be taken to The Success Manual store on Gumroad.com, where you will make the payment and get the PDF in your email right away. Q: I just bought the book but don't know what to do next. How do I get it? A: You should receive an email containing the download link. The download contains the PDF version of The Success Manual. Q: But I never received an email with a download link, what now? Q: Why only PDF / EPub format? A: We want to save trees. We hope you will too. This PDF / EPub book is designed to be read easily on all devices, desktop PC or a smartphone/tablet. You can easily carry it everywhere. Use the Table of Contents/Bookmarks to get instant advice on any pressing topic. Print out the guide you need. Q: What about other versions of The Success Manual? On your Android phone, there are many PDF readers in the Play store, including Acrobat. On the iPhone, you just need to drag the pdf version of The Success Manual into your iTunes Book library and you can start reading. Q: Is there an affiliate program for the ebook? A: If You wish to be affiliates, just send us an email at [email protected]. We give 30% payouts. A: You can sign up to read all the 290 skill guides, as well as read new stuff. You can bookmark, track your performance in quizzes...it is a new online book reading experience. Q: How do I use The Success Manual best? Just go through the How To Use/Introduction guide. guide. Just browse through the 'Table of contents' or 'Bookmarks'.